As a member of the 34th Bomb Group, Sgt. Brunette headed a squad of ordnance men who fused bombs and loaded them into the bomb bays of big, lumbering B-24 Liberators, a plane that Brunette did not particularly like. They were sitting ducks – a too slow moving target. 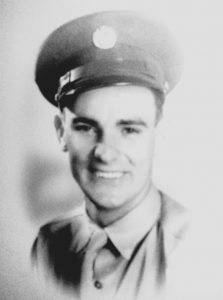 Bill Brunette was a young fellow working in Palestine, Texas, when the Japanese bombed Pearl Harbor on December 7, 1941. By the end of the next month, he was in the Army and his life had changed forever. One of the first things Brunette had to do was take a test. He knew if he passed it, he would be in the Army Air Corps, so, he said, “I tried to pass it!” He read and responded to each question carefully, and when the test was scored, he was on his way to the Air Corps, what would later become the modern day Air Force. Brunette went to Ellington Field near Houston to receive his basic training. He thought for a while he would be sent to India but was relieved when he went to bomb training in San Angelo instead. In April 1944, two months before the Normandy Invasion, Brunette and the 34th Bomb Group left Fort Miles Standish in Cambridge, Massachusetts, for a 14-day voyage to Liverpool, England on the U.S.S. Singapore. From there, it was a short trip to Mendlesham, England, to fuse and load bombs in planes bombing Nazi positions on the European mainland. As a member of the 34th Bomb Group, Sgt. Brunette headed a squad of ordnance men who fused bombs and loaded them into the bomb bays of big, lumbering B-24 Liberators, a plane that Brunette did not particularly like. They were sitting ducks – a too slow moving target. Arming them was a job that required skill (you did not want to mess up a fuse on a 500-pound bomb), patience and strength. “We had to go to school to learn how to fuse bombs,” said Brunette. Before the 34th devised a mechanical hoist, bombs had to be loaded by hand, a job that took three to four men working together to left bombs into a plane’s bomb bay directly overhead. “We worked at night,” said Brunette. “The planes flew out in the morning.” Plane crews were engaged in the risky business of daylight precision bombing; ground crews were engaged in the business of fusing and loading bombs in the dark, with just a small light under the plane. The base was blacked out every night. “We had five minutes from the time incoming planes were picked up on radar,” five minutes to get ready to re-arm five B-24’s, or later in the war, arm five of the more maneuverable B-17’s, the Flying Fortresses. The squad would have to take a truck to the other end of the field and load it with bombs and 41 lb. ordnance boxes to meet the planes as they came in. Enough bombs to fill a three-acre field were moved in every day. The job was difficult but reasonable at first. But then came June 6th and the Normandy invasion and bomb loading became an almost 24-7 ordeal with bombing missions running throughout the day and night. As soon as the bombers came in, they had to be reloaded and made ready for another mission. That meant loading twelve 500-pound bombs on each plane – a total of 6,000 pounds, and loading all the ammunition for the gunners. Loading 100 planes, the number that typically took off for a mission, required 20 crews servicing five planes each. Attaching the fuses to the tail and sometimes (depending on the bomb), the nose in the dark was challenging. In the early days of the war, fuses had been attached hours before the bombs were loaded, but in an attack on Lille, Germany, in December 1942, about a third of the bombs did not explode. The arming mechanisms had frozen up after being exposed to damp conditions on the airfields overnight. By the time Brunette arrived, fusing bombs immediately before loading them had become standard procedure. Fusing bombs was also tricky because different bombs had to be fused in different ways, explained Brunette. General-purpose bombs required one kind of fuse, fragmentation (anti-personnel) bombs and incendiary bombs had to be fused in another. All had to be done with care. Brunette remembers relieving crewmen who got impatient or sloppy. The war got hot for Brunette when the Germans started following the 34th back to base to retaliate. Brunette remembers June 8, 1944, when “we lost four planes and 36 men in one night. We lost them right over the field.” The planes were coming in to land with the Luftwaffe was right on their tail. The result was total chaos. “Hit the ground” was the order of the night. German strafing runs over the field were also becoming routine as the allied invasion progressed. In the months that followed, Brunette and crew started loading 1,000-pound bombs, six per plane, to clear out a mile and a half strip for British General Montgomery to advance through. Before Brunette left England, he was loading 2,000-pound bombs. During the Battle of the Bulge, the biggest battle of the war, “everything froze over – we had to get all the snow off the runways before the planes could take off and land.” Off duty, Brunette and crew were huddling in little huts with coal fires to warm them (hardy warm them). On duty, crewmembers worked in sheepskin flight suits to protect them from the extreme cold. The 34th Bomb Group flew its last combat mission in the war on April 20, 1945, but Brunette did not get to return home until the summer of 1945. “All the sick and injured were sent home first.” He came back on the Queen Mary, the greatest luxury liner of its day, but during its service as a troop ship, it was hard to find the “luxury” aspects.